Blue Suede New #36: Eddie Cochran, Red Robinson, Fats Washington, Ernie JOhnson, Andy Starr, Rockin' Rhythmbily Weekender, Rockabilly, Blues, '50s Rock'n'Roll! Issue #36 - Fall 1996 - Scroll down to order!! Blue Suede News #36 (Fall 1996) has 68 pages with a slick cover. 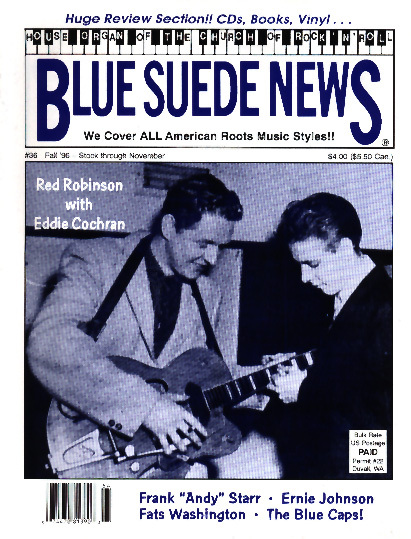 On the cover is Eddie Cochran with Red Robinson and Red was a concert promoter and Dee Jay in Canada. He got to work with many Rock'n'Roll legends including Elvis Presley, Fats Domino, Johnny Burnette and Eddie Cochran. Very informative story with cool vintage photos. There is also a story about the Eddie Fest in honor of Eddie Cochran. Among the acts were the Vees, Rockabilly band comprised of Bobby Vee's sons. Blues fans will love the extensive story about Fats Washington and Ernie Johnson titled The Blues Legend and the Soul singer. Rockabilly fans will enjoy reading about one of the original '50s Rockabilly performers, Frank Andy Starr, the Ozark Flash. Wild times! Frank "Andy" Starr is very outspoken and some of his stories are almost too good to be true. Very entertaining and informative. There is also a feature article and photo page about the Denver Rock'n'Rhythm-Billy Weekender (#1), great show with Rockabilly and related music styles performed by Hardrock Gunter, Dave & Deke, Willie Lewis and others.